In my last post, I shared a rather lengthy write-up of a geospatial data project I’ve been working on–I hope that some of it is helpful! While I feel that this network offers a greater degree of granularity on uses of place name, right now I feel also that it has two major weaknesses: 1) it does not interact with the geographic map, and 2) I am not sure how well it captures place name’s use within the narrative itself. My question to you, fellow digitalists: what are ways that I could really demonstrate how place names function within a narrative? Should I account for narrative’s temporal aspect–the fact that time passes as the narrative unfolds, giving a particular shape to the experience of reading that place names might inform geographically? How could I get an overlay, of sorts, on the geospatial map itself? Should I consider topic modelling, text mining? 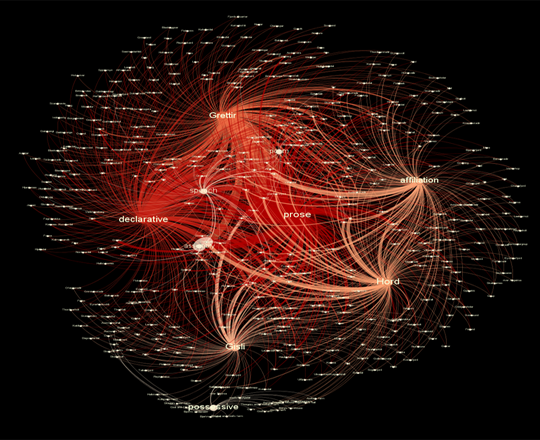 Are there potential positive aspects of this Gephi work that might be worth exploring further? Submitting to you, dear readers, with enormous debts of gratitude in advance for your help! And even if you don’t consider yourself a literary expert–please chime in. We all read, and that experience of how potentially geographic elements affect us as readers and create meaning through storytelling is my most essential question. This entry was posted in Fall 2014 and tagged Data Analysis, Data Project, dataset, Gephi, literature, Topic Modeling on November 25, 2014 by Mary Catherine Kinniburgh. For those feeling a bit anxious to see theory and practice side by side you should all read Ted Underwood‘s Blog The Stone And The Shell. He is a Romantic Lit scholar and a DHer and he does a really nice job showing his work and talking about the uncertainties, and he’s really nice and you can tweet at him and he will for sure talk to you. I took a text mining class he taught, he is just the best. Topic modeling made just simple enough. This entry was posted in Uncategorized and tagged literature, Ted Underwood, What is DH on September 12, 2014 by Julia Pollack. 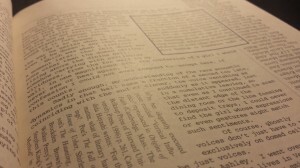 House of Leaves, by Mark Danielewski. Text no longer moves in one direction. Studying Digital Humanities is something I never knew I wanted. Years after beginning my undergraduate career I cursed myself for choosing an English degree. Sure, I loved reading and discussing literature, but aside from pursuing a life in academia , what real-world purpose did it serve that I could parse the connection between the sarin gas attacks in the Japan subways in 1995 and Murakami’s depiction of time in A Wild Sheep’s Chase? Sure, I have a handful of sonnets memorized, and while they might be fun to recite in front of girls, they most likely won’t get any potential employers in bed with me. I had so many interests growing up! Why did I choose the one that—based on my limited knowledge of the job market—seemed so fruitless? In my free time I studied digital rights management, so why didn’t I change my major to law? When I was 13 I learned HTML while playing Neopets, so why didn’t I change my major to Computer Science? After writing a research paper on digital media, consumer convenience, and the future of software models, why didn’t I go for business? Finally, why did it take me so long to find out that Digital Humanities was a thing? After finishing my undergraduate English degree (get this… you’ll never believe it…) I applied for a doctoral degree in English. Unbelievable, right? Despite my utter pessimism about the efficacy of studying text, I decided to study text some more. I believed that I would either end up a professor of English, or quit academia and get a job working in new media and digital software, parallel, yet distant paths. One day I would stray too far in one direction and the other path would be forever obfuscated, lost in a sea of software or perhaps a forest of leaves. Before hearing back from graduate schools, I filled my time by recording a weekly podcast about video game sub-cultures. A friend and I bought recording equipment, learned audio editing, studied distribution methods via RSS feeds, built a website, and wrote a list of topics that would last us over a year. We got together every week, and recording the show became a labor of love. Not only did I get to speak passionately about a topic I was enthusiastic about, but I became a participant in active conversations regarding e-sports in America, online streaming, and the efficacy of new business models for digital software. I worked for hours every week drafting show notes, learning history, and gathering opinions from experts to discuss and refute. This solidified that reading and writing text could not be my sole future. When I was contacted by a representative from the Graduate Center, it was to tell me that I was not accepted to a doctoral program, but also that I should consider a Masters track for Digital Humanities, as it seemed better aligned with my interests and work. I wasn’t upset, just intrigued. After reading up on DH, I realized I wasn’t just interested, I was already a participant. In fact, many people with my interests were already unknowingly participating in Digital Humanities. Not only did Digital Humanities as a concept renew my interest in academia, it renewed my interest and optimism in English and Literature as a viable track of study. While text continues to be an important facet of humanism, there are many alternative media formats, such as films and games, that can speak on similar subject matter, albeit, without the seniority. Digital Humanities not only grants us a space to re-examine texts in digital formats and tools, but creates a bridge through which English might become a more multi-faceted, interdisciplinary track. After all, being able to read and write at the highest academic levels seems attractive when you consider just how much you’re reading and writing through social media platforms. I believe that Digital Humanities has the ability to alter the approaches and pedagogy of not just English, but any discipline held back by the trappings of academia. Lisa Spiro states in her essay, “This Is Why We Fight” that “emphasis on specialization and professional authority clashes with the collaborative, crowdsourced approaches of the digital humanities”, and I believe this to be the definitive attraction to DH: it truly encourages an iterative, interdisciplinary approach, whereas many tracks and individuals intentionally alienate themselves in an attempt to gain absolute authority over their ideas. How does that better the medium? How can one learn and innovate if they shut themselves out from all that is available to teach? There’s so much more to say, but this is already far too long. I have so many questions and so many ideas, all I can say for certain is I’m optimistic about the future.